Fits round, oval, square or rectangle flues tiles lined or unlined. 5/8" mesh that conforms to California codes. 3/4" mesh is available at no extra cost. 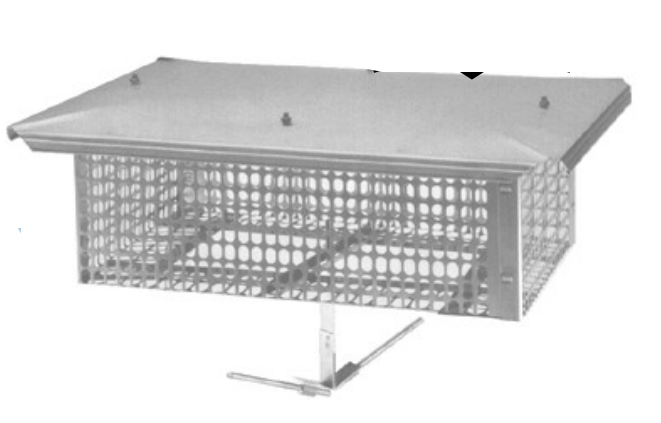 CCSUC1313 13 x 13 UNIVERSAL CAP S/S 6" x 6" to 13" x 13"
CCSUC1318 13 x 18 UNIVERSAL CAP S/S 6" x 12" to 13" x 18"
CCSUC1818 18 x 18 UNIVERSAL CAP S/S 12" x 12" to 18" x 18"
CCSUC1321 13 x 21 UNIVERSAL CAP S/S 6" x 15" to 13" x 21"
CCSUC2121 21 x 21 UNIVERSAL CAP S/S 15" x 15" to 21" x 21"